Decorated with a nine-ball ornament dangling from his neck, rings covering each finger and a hulking pack strapped to his back, Patrick Bral spends most days on his feet. As a homeless man, Bral faces the challenge of locating a safe place to rest after his daily treks — a task that became even more daunting after voters passed the so-called “sit-lie” ordinance nearly six years ago, a law that makes sitting or resting on public sidewalks an illegal act. 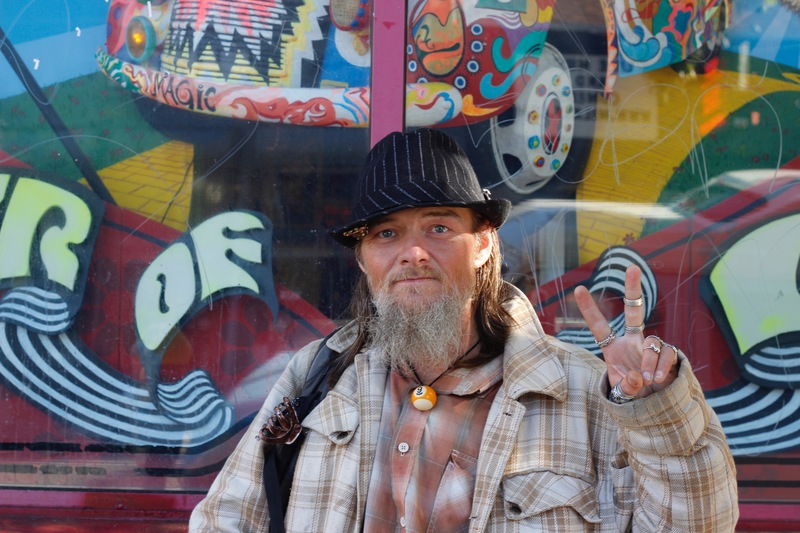 Bral is one of the several dozen or so street people who still sprawl on corners and in doorways in the Upper Haight. Although there are fewer street people in the neighborhood than when the law was passed, the controversy over sit-lie remains heated. A recent report commissioned by Supervisor Eric Mar found that so-called quality of life laws like sit-lie are expensive, largely ineffective, and have made large numbers of homeless people miserable in the process. Nonetheless, public anger at the homeless is growing, and the passage of regulations that activists see as punitive appear more likely than a repeal of sit-lie. Supervisor Mark Farrell, for example, has introduced an initiative on the November ballot that would ban homeless camps in San Francisco. Does sit-lie help or hurt? Though some community organizers in homeless hotspots like the Haight believe the sit-law law has helped the neighborhood, some police officers and members of the San Francisco Board of Supervisors are not convinced sit-lie is doing any good. According to Avalos, sit-lie was pitched to voters in the 2010 election as a means to appease their anger over the homeless population, rather than introducing an actual solution. “It was a measure to scapegoat and demonize homeless youth, and it was very effective in doing that,” Avalos said in a telephone interview. Some police officers charged with enforcing the law now say that sit-lie is only a temporary solution at best, and a more extensive approach is needed in order to address homelessness as a whole. Manfredi says police understand that being homeless is difficult. They often try to reach out and explain the services San Francisco offers before writing a ticket. But even in those cases, it does little to alleviate the problem, he says. However, others argue that while sit-lie isn’t a perfect solution, it’s still had a positive effect on the Haight, where it is frequently enforced. 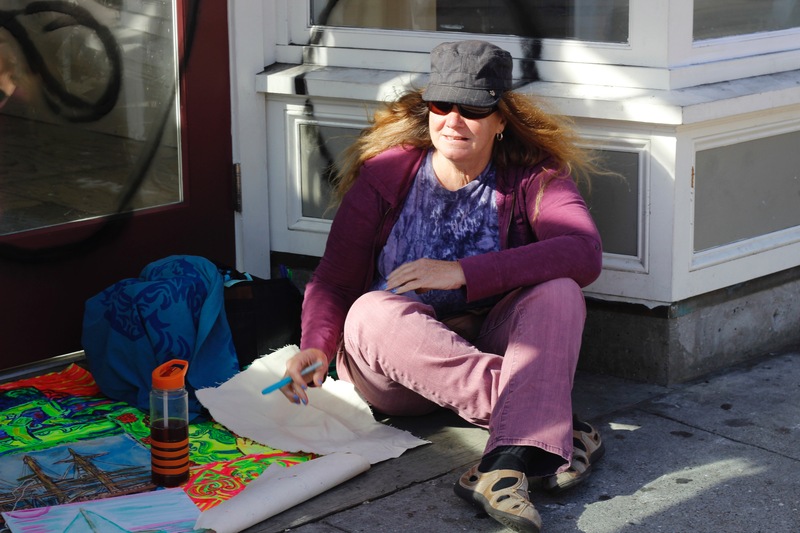 “We’ve seen a decrease in transients operating on the sidewalk (in the Haight) and so I think that’s helped the community,” said Ted Loewenberg, the president of the Haight Ashbury Improvement Association. Like it or not, says Avalos, sit-lie will probably not be repealed in the near future. “I don’t see that happening this November, and there are no other elections in San Francisco for a couple years,” said Avalos. The proposed November measure would allow authorities to dismantle homeless encampments with a 24-hour notice. The initiative and the likely continuation of sit-lie makes Bral nervous. 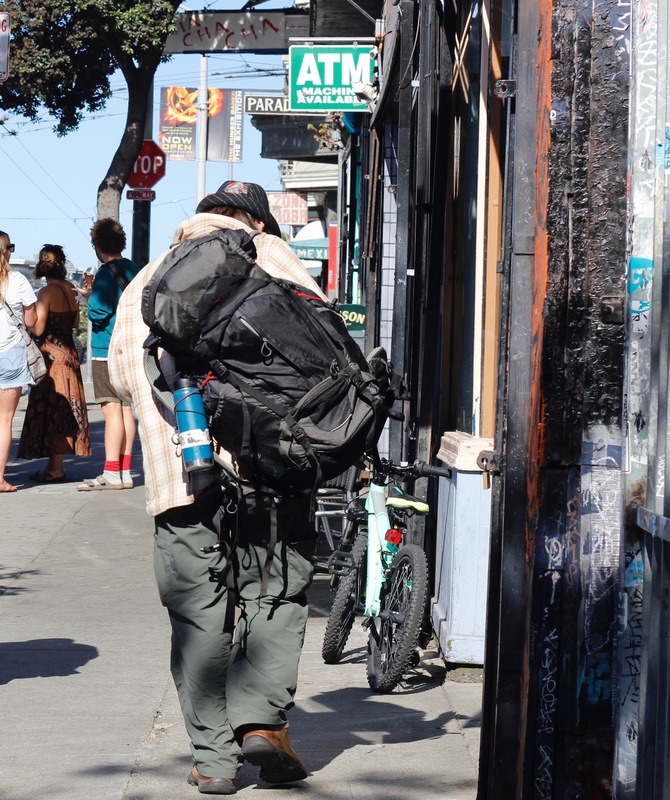 Patrick Bral continues his walk down Haight Street with most of his belongings strapped to his back on Saturday, June 25, 2016. This is a complicated problem, thank you for the information and update. No one should be homeless in this country. The claim of “lack of funds” is false, No one has ever seen a war that we didn’t have billions to throw into for corporate gains. Just today we invaded Libya, and media failed to mention this cost, or the war. No one mentioned the Drones multiplying in Africa that taxpayers will pay for, but nothing for public education is coming? Priorities? This entry was posted on July 6, 2016 by Bay News Rising and tagged ballot, BNR, elections, Feature, Homeless, Homelessness, News, San Francisco, SF, sfpd, sit lie law, Sit-Lie.